Thirty beautiful mamas and two little peanuts joined us for an evening where nothing, not elbows, an extra glass of wine, or labor and delivery war stories, was off the table. Getting out of the house is important. It is especially important if you’re engaged in the early-waking, mess-making, back-breaking work of mothering. It is hard to take a breath of fresh air for yourself when your moon and stars (however cute they may be) seem to take up the whole sky. That is precisely why Holly and I cooked up the Golden Hour Supper + Social--to give mom that delicious deep breath she deserves and cover her in love. 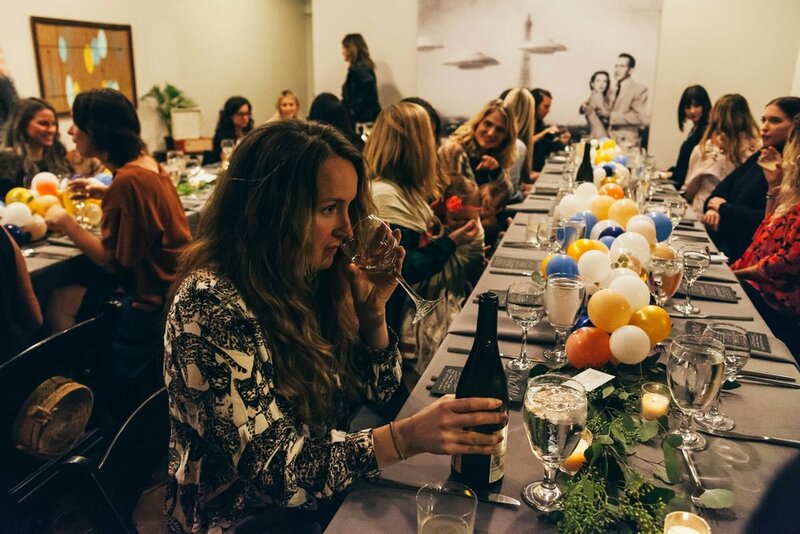 Thirty beautiful mamas and two little peanuts joined us for an evening where nothing, not elbows, an extra glass of wine, or labor and delivery war stories, was off the table. We laughed a lot, cried a little, ate, drank and yes, we really, actually RELAXED. I felt my shoulders drop about two inches before cocktail hour was over and I was (supposed to be) working. Holly and her Golden Roots crew dreamt up the most delicious menu centered around nurturing and nourishing the tired mama soul. We started with whipped cashew ricotta, pumpkin gnocchi, and WithCo cocktails, and then moved onto a beautifully bright honeycrisp salad and a knock-out five spice char siu pork. The meal closed with a caramel tarte that, frankly, has ruined me for life. I could have eaten four of them. Every bite was perfectly complemented with carefully selected wine pairings by Tavola. To the generous local brands whose thoughtful products made our swag bags so dreamy, thank you! You made each and every one of our attendees feel like it was her birthday. To Holly, I love every gorgeous angel inch of you. Having you as my partner in this was nothing short of heaven. To our amazing guests who got gussied up at the end of what I know was a long day (aren’t they all?) and decided to spend their precious time with us, you are amazing and wonderful and it was such an honor to host you. You truly are as good as gold. Until next Fall, ladies! Now, it’s onto the holidays! To check out some of our greatest, most giftable January Moon designs (including our new keychains), visit Nashville’s Winter Showroom from 11/9-12/24. They’ll be decking their halls with a carefully curated selection of local goods just in time for shopping season. See you there!